Do you have a Rabbit First Aid kit set up at your house for your buns? First off, I will say that Rabbits get sick fast, and have to be treated fast. No matter what this issue, a wound, respiratory, or digestive, you need to go to a rabbit savy vet ASAP, these suggestions are only to supplement vet care, and have on hand for emergencies. It takes an initial investment to get this ready to go, but it is so worth it when you realize your bun is sick. If you can’t get it all at once, I would try to start buying a couple of the items every few weeks and adding to my kit until I had it complete. I definitely didn’t have all this starting out, it has taken years of trial and error to get my kit like it is today, and some of these things may not work for you. This is simply a suggestion, you may need to add many items to this, but this is a good place to start. I am going to go through a few of the major suggestions to help you understand why I included them, but most are self-explanatory. 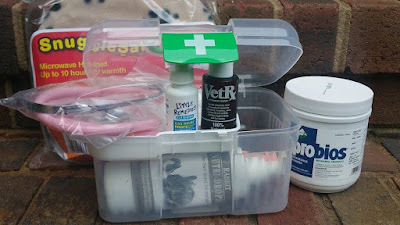 The first thing I would suggest having in your first aid kit is Vet Rx for Rabbits. This product is miraculous for rabbits with colds/allergies, and it can also be used to treat ear mites. Plus, I love the fact that this product is all natural. All rabbit owners know the fear of stasis. This happens when something like wool stops up the intestinal tract of your rabbit, and causes them to stop eating/drinking/pooping. When this happens, you need to get to the vet, ASAP. The products I am suggesting here are only to help prevent and restore balance to their intestines. Please always go to the vet immediately. ProBios replaces the probiotics in the gut. I sprinkle a bit of this on their food everyday. Little Remedies Gas Drops are used to treat bloating and other digestive issues. A Stethoscope is a great addition because you can listen for bowel sounds, in addition to having it to help detect respiratory issues. When they get sick keeping their tract nourished is important. I have Oxbow Critical Care in the freezer just in case. This is a finely ground feed that is easy on their system. It can be easily mixed with water and syringe fed. The final product that I am suggesting for digestive issues is a heating pad that was created for animals. Snuggle Safe provides heat safely, which is recommended to help them battle stasis. Whether you are treating a wound like sore hock, a broken toenail, or a bite, once again, start at the vet. However, I keep Vetericyn wound care in my kit. This spray helps clean the wound and prevent infection. I keep styptic powder on hand to stop bleeding, and Green Goo as a healing salve. I am including the link to dried chamomile because it is an herb that is amazing healing abilities. Not only will it help soothe the nerves of a rabbit with anxiety, but it also has natural antibiotic properties. So, I offer this daily to my rabbits, free choice. But, I also keep it to treat any type of eye issues such as runny eyes or infection. Finally, I keep a bag of Food Grade Diatomaceous Earth. 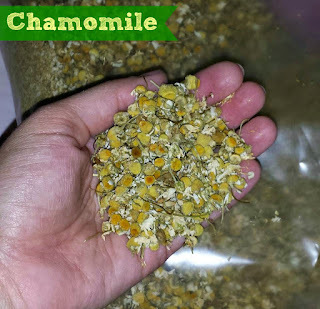 I use this occasionally to help prevent any type of parasites that may invade the gut. 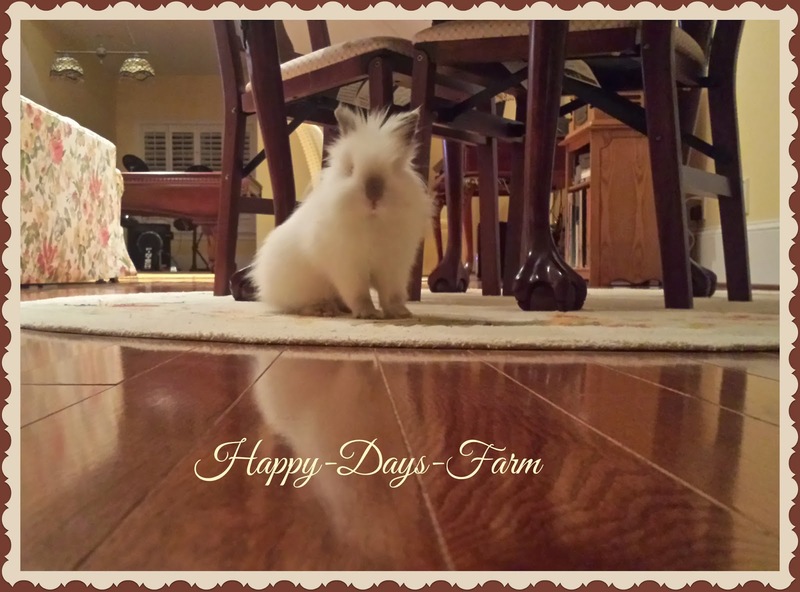 When I first rescued my rabbits, I added it to their feed for several days. Now, I may add a small sprinkle one a month. I always mix in extra probiotic powder at the same time. You can also use the Diatomaceous Earth carefully, to treat fleas and mites. Avoiding the eyes, and nose, you can carefully massage some into their coat, and it will kill the fleas. It is aggravating for them to breathe it, so make sure not to create a cloud. I have added the Amazon Affiliate links for many of the items that are not easily found, but several items are available at most grocery/drug stores.